Update Dec 13th: The archived recording of this webinar in Adobe Connect is available. These are my presentation slides for today’s free ISTE SIGML webinar, “Introduce Students to Coding with Hopscotch for iPad.” The webinar starts at 7 pm EST. 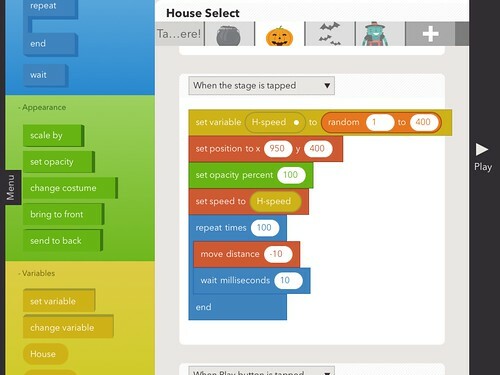 Hopscotch is a free iPad app which supports block-based programming, similar to Scratch software from MIT. In this webinar, grade 4-5 STEM teacher Dr. Wesley Fryer will demonstrate and explain how he uses Hopscotch to introduce his students to the basics of computer programming. With Hopscotch, he has helped students learn to create geometric pictures as well as simple games. Wes will also discuss a free eBook he published in November for the Hour of Code, “Hopscotch Challenges,” which provides an overview of Hopscotch along with suggested project ideas and tips for students and teachers to try using the app. Access Wes’ iPad Coding resources (including the free “Hopscotch Challenges” eBook) on http://stem.wesfryer.com/home/ipad-coding. Please join us in SIGML’s Adobe Connect Room at http://bit.ly/18iXN96 on December 11 at 7 PM EST!